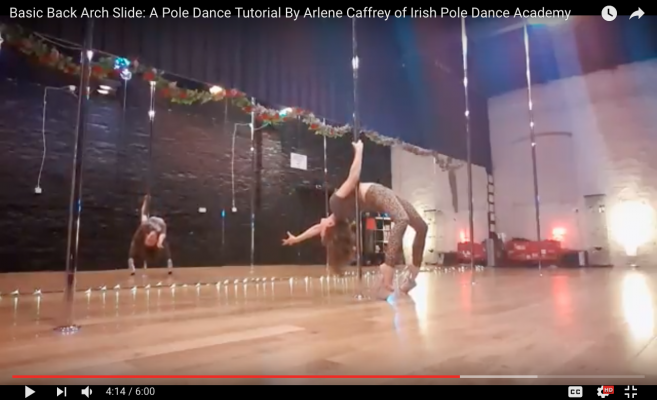 Video Blog 51: Basic Back Arch Slide Tutorial | The friendliest pole dancing classes in Dublin City Centre! I’m delighted to bring you another tutorial! Yay! This one is a lovely basic backbend achievable by all. Yes, even if you tell yourself that you do not have a ‘bendy’ back, you can still do this move and rock it. Trust me. I’ve been there! I really love doing this trick in heels as it means that my legs become proportionally longer, thus making my backbend feel more comfortable. (Plus I just love doing everything in heels). I encourage you to try this move barefoot initially. You can try it in heels later once you have practised! Having your feet hip width distance apart and away from the base of the pole will create a more gentle and more comfortable backbend. Think of the movement as sequential; start with your head and move down through your neck, shoulders, mid-back, lower-back to create a curve vertebrae by vertebrae. The downwards motion is initiated by the bending of the back, not by the bending of the knees! In order to achieve this, think about pushing your hips up/forwards and do not allow the knees to bend until you have created your backbend (vertebrae by vertebrae as above in point number one). Remember to land gently: the back of your hand should reach the floor first, tuck your chin to protect your neck and hips land last. When you feel more comfortable, you can focus on keeping a nice high relevé by extending you ankles. Let me know how it goes for you! Have fun playing with transitions into and our of this move!